The Bureau de la sécurité privée oversees the implementation and the enforcement of the new Private Security Act and its regulations, issues licenses for agents and agencies and addresses complaints received against licensees within six industry activities identified by law. The Parity Committee for security guards is a non-profit-making organization responsible for overseeing and ascertaining compliance with the Decree respecting security guards, by virtue of An Act respecting collective agreement decrees (section 16). The Labor Market Information (LMI) groups all information that could prove useful for people who are looking for a job, who must make a career choice, or who want to improve their current job situation. The Canadian Security Association (CANASA) is a national not-for-profit organization dedicated to advancing the security industry and supporting security professionals in Canada. 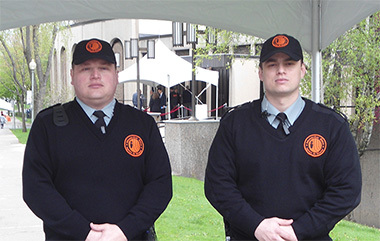 The Sûreté du Québec (SQ) as the national police force, contributes throughout the territory of Québec, to maintaining peace and public order, preserving life, safety and fundamental human rights and protecting property. The Sûreté du Québec also supports the police community, coordinates major police operations, contributes to the integrity of governmental institutions and ensures the safety of transport networks under Québec jurisdiction. The Service de police de la Ville de Montréal (SPVM) is the second largest municipal police force in Canada. The Royal Canadian Mounted Police (RCMP) is the Canadian national police service and an agency of the Ministry of Public Safety Canada.